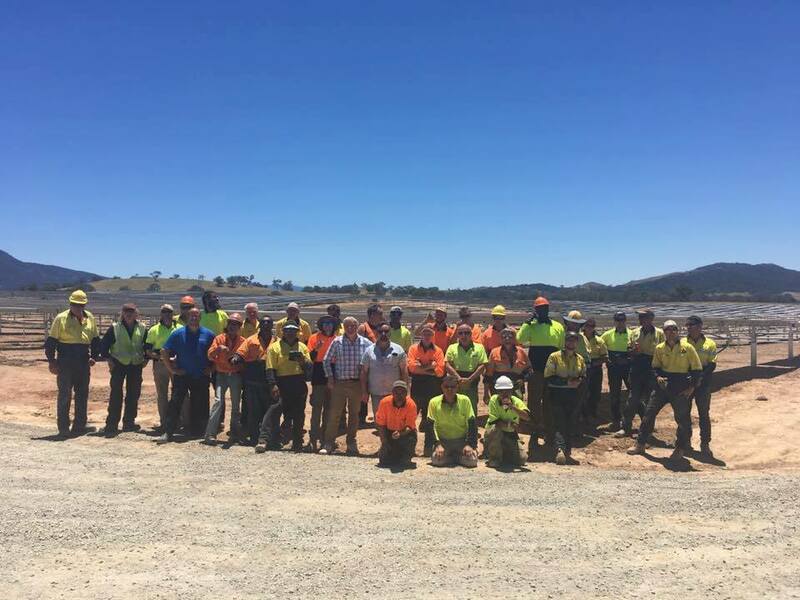 We are proud to have been the preferred labour hire supplier in Canberra for the Williamsdale Solar Farm. Completed in February 2017 the 11.18MW Solar Farm Project will generate more than 21,910 MW hours of clean energy in its first year of operation. The $35 Million Dollar Solar Farm Project continues the ACT Government’s emphasis on attracting large solar projects to the Australian Capital Territory. The Williamsdale Solar Farm is located 20km south east of Canberra, ACT. The 30 hectares of solar panels will track the sun’s radiation based on a single axis tracking mechanism. The Williamsdale solar power provides safe, clean, very low emissions power generation. The project will save approximately 460,000 tonnes of carbon emission over its lifetime. Employ Me was under strict direction and supervision to ensure the project is to be completed on time and within budget. Furthermore, as part of the approval process all contractors were required to reduce glare during construction and operation of the solar farm, to maintain appropriate landscaping and ensure sufficient bush fire management measures are in place for the area. Employ Me staffed over 20 000 hours of labour to the project from Skilled labourers to Qualified Electricians. Employ Me takes pride in supporting local business and engaged Capital Roast Catering to provide all Williamsdale Solar Farm personnel with a catered Christmas lunch in December 2016, where we also had the Red Bull Wings Team provide workers with cold refreshments. As a leader of our industry it is very important for Employ Me to be involved in such Environmentally Friendly Projects that provides clean energy and a sustainable future for Australia. It is at Employ Me’s core values to provide Australia with the best Labour Hire for influential Projects such as the Williamsdale Solar Farm. Employ Me Labour Hire Australia is a leader in the Labour Hire Industry, particularly in Canberra as this is where our head office is based. Employ Me has rapidly grown since 2011 and we have always strived to work closely with our labour hire team to maximise productivity and efficiency on projects. As a leader of our industry it is very important for Employ Me to be involved in such Environmentally Friendly Projects that provides clean energy and a sustainable future for Australia. It is at Employ Me’s core values to provide Australia with the best Labour Hire for influential Projects such as the Williamsdale Solar Farm. We have the highest level of confidence in our Labour Hire Team and we take all feedback on board from our clients to ensure we Employ only the best candidates.